Holidays provide lots of reading time -- both in transit and while sitting around with family. Still working on an Erma Bombeck and then will start the first Dexter book (probably for the plane ride home). What have you been reading this year? Laughed out loud in MANY places in this collection of columns. My mom checked it out for me while home, and it was a great thing to read during slow times. Definitely think reading funny essays can help one become a better writer. We'll see though! A funny book recommended long ago by and purchased this Christmas for me by Shawn. But there was one part that was too disgusting and ruined the whole thing for me. I like Stephen Fry (especially his Bones character), but now ... like him less after reading this. Not recommended. Clip in bangs, pretty spot on once Beth flattened my hair. Now off for a snowy "mountain" drive and hopefully some photography. 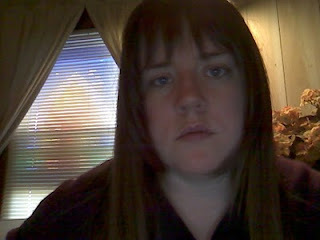 I should really put on makeup before I take a picture for the blog. Meh. This character in a kids show has caught on ... at least the name is being used by my sister and myself as a put down ... like a Doofus, but with a long crazy word. We're loving it. I've been an even bigger doofenshmirtz this week than normal, and that's saying something. It is ridiculously cold here. (Requisite weather update for my loyal Danville reader(s)) The snow started falling again, but it's much lighter than the blizzard of Christmas 09. It's falling consistently but apparently much less wind and not as bitterly cold. Am looking forward to playing in the snow some more. We've built snowmen and snow angels. When I get my act together I'll transfer photos and post retrospectives. Probably best as I enjoy actually BEING with Owen when I'm here and then documenting our activities later when I can be a little more deliberate about things. Off to Gran's, where Owen has been since lunch. 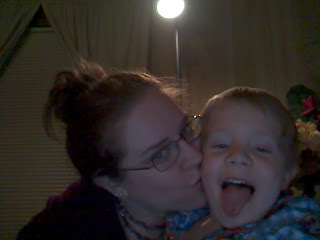 Easier to concentrate when he's not here BUT working isn't nearly as fun. In addition to my regular work email address I also am responsible for the "editor" and "webmaster" inboxes. Unfortunately I don't know the passwords for those accounts to check them remotely and it's always a problem when I travel. I had a flash of "brilliance" before we left for Christmas. I could set up a rule in Outlook to forward all messages in those inboxes into my main email box. In reality ... I am still not seeing any of my editor or webmaster e-mails BUT every message that comes into my main inbox is then forwarded again to my main e-mail, resulting in a duplicate set of messages. It's easy enough to just delete as they come in, or select all messages from myself and delete, but come on. I even thought I tested it, but clearly not. I guess if this is my only work issue I'm doing OK, and for the most part I am. UPDATE: I figured out how to delete those rules. I couldn't edit them, and Outlook online gave me grief about things not matching with regular Outlook when I turn it on next, but that's OK with me. At least my inbox is clean(er). I guess I'll just slog through the webmaster and editor inboxes on Monday. Probably not much will be there. I'll try to figure out a solution the next time I travel and work. Hrm. I hope everyone who got one likes them, and all my readers, whether I’m with you or not, have a very Merry Christmas and Happy New Year! The weather people are going nuts on the TV station (a much bigger deal here than the winter storm this weekend in New York). I do want a White Christmas, BUT I want one with OWEN! This gives me a inordinate amount of pleasure. Last year I included the four of us plus Dawn, so this year Diannia gets thrown into the mix. The country dance we had last year was still an option, but this was a new one -- singing. Oh brother. My life isn't on par with Carrie Fisher's in the funny department, but it feels like I'm living in a sitcom sometimes, without the resolution-in-30-minutes. Our sink is still out of commission, and a week later we're still brushing our teeth/washing our hands in the kitchen. It adds a few steps to my day, so I guess that's not a bad thing, but I gag a little every time I spit into the stainless steel of the kitchen sink. Vom-dot-com. The missing part is still missing, and I don't have an update from our super or the handy man about its eventual delivery. The handy man said the sink should just be replaced, but somehow I doubt we'll see that in our tenure in this apartment. Anyway, today I'm brusha-brushing (as Owen might say) and took my glasses off, setting them on the side of the counter to rinse my face afterward (another Vom-dot-com-worthy task). I put the glasses back on my face and I can't see! And I'm only half-awake so I think maybe one of my eyes suddenly got a whole lot worse, when I realize that the lens has popped out of my glasses! This is not the first problem I've had with these glasses, and their short-lived PRADA predecessors. I've rigged them to be able to see well enough, but a trip to Lens Crafters is in my immediate future. I found the screw and maybe they can put them back together (I tried and the screw didn't want to hold, so it may need a new one). I would put in contacts BUT I think my left eye really has changed because I can't see as well in contacts as in glasses because of the left eye. 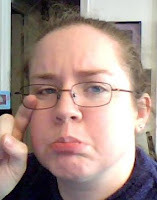 Since it's the right lens that popped out maybe I could wear the right contact plus my glasses with only the left lens. What a riot ... or not. Oh, and my office is closed today for the snow, which I thought could happen but didn't know for sure until I'd already worked a couple hours. Not that it makes sense for me to lay out ... I can work despite the weather and so I am. Saks Fifth Avenue Snowflakes from Mari Walker on Vimeo. The snow is coming down now, but nothing major like I'd been led to believe. Apparently in Danville it's a mess. Beth said we might get snow on Christmas in Oklahoma, but I'll believe that when I see it! Clearly we're feeling good and living it up in the city. I'm excited about being sort of snowed in tonight. I've got the Christmas tunes going and a crochet project to start. Christmas music is really the greatest. I've been mostly tapping into my Pandora collection, which means a lot of stuff I haven't heard lately (or at all). I still groove every.single.time to All I Want for Christmas is You (Mariah version only). Unfortunately they don't have the Trisha Christmas album, and somehow that's disappeared from my iTunes, so I need to track it down ... it's on the backup drive (or worst case the CD is in my closet). I definitely love listening to her Reindeer Boogie and other holiday tunes. Homewrecker or not, I love TY. So I solved my post office dilemma. I asked Shawn to mail the packages ... and he did! (I don't even feel bad, since I picked out, shopped/ordered and wrapped all the gifts we've purchased so far!) Now all our packages are on the way, and I spent less on shipping than last year. Hope that doesn't mean things will arrive late, but probably that I purchased lighter items this year. We'll see how it turns out. ALSO, on his way back from the post office he picked up a new iPod connector cord for me. What a cutie, and definitely making my life a lot easier! Christmas cards will go out tomorrow ... I've got to update my spreadsheet to be sure I capture all the new addresses before they're scattered. I've also got one crochet project I want to quickly attempt and carry back with me to OK. We'll see though. Random: how's this for a question: What would a person who doesn't like you have to say about you/your work professionally? First, a positive note. How CUTE are these Crankypants? Featured on Dooce, which I skim in my reader from time to time. Anyway, that made my day, remembering our Captain Cranky Pants and knowing I'll see him in just over a week. What didn't make my day was that I realized yesterday that I left something on the plane. It's nothing huge, just my Le Sport Sac pouch that I keep my iPod in. My iPod wasn't in it, but my cord to connect to the computer/charge it and my headphone splitter were. Also my cleaning microfiber cloth and possibly some business cards (meaning a very small chance it could be returned?). I just hate being a DUMMY like that and not checking the seat back pocket. What a maroon! I e-mailed AA (because their site said talk to LGA and LGA's site said to talk to AA). I was given a lost and found number. I called it, the guy said "hold on, let me check" and I waited. He said he didn't have it, which didn't surprise me. He said it wouldn't turn up, so he didn't take my number or a description or anything. Why isn't this an automated system where the employees can plug it in, so if it turns up in the lost and found, say at the airport the plane went to AFTER LGA, it would ping a match? It's not like I can't replace the cords. And the little pouch, while special to me and the pattern probably not recoverable, isn't a big deal. It's just a THING. Then why am I so cranky pants about it? Unfortunately it's not the ONLY thing I'm stressing about. You'd think I'd come home from a vacation all blissed out and relaxed. HA! Not this girl. I'm finishing my Christmas stuff, which while fun is still stressful -- especially knowing I still have to face the post office sometime this week. Maybe I'll do it first thing one day and try to beat the rush. Doubtful. We didn’t climb the steps because I really had to pee. Not the first time my bladder has made me miss something like that, but it could have been much worse (I was able to make it to the port-a-potty in the park)! Back from another day, and this one was much better than yesterday, although still plenty of driving. After a Starbucks treat, I made it to Sawgrass Mills, a GIANT outlet mall near Ft. Lauderdale. I mean GIANT. And so poorly laid out. I like Arundel Mills and Potomac Mills – where things are at least laid out in a circle (i.e. no back tracking required). That’s not the case with this one. After some small purchases and feeling exhausted, I stopped for lunch, which helped matters tremendously. Then it was on to the beach again. Ft. Lauderdale this time since I was there. Easy parking – plenty right beside the ocean and for $2 I had over an hour to chill out. There are palm trees on this beach, so the afternoon sun created a nice shady spot by the water where I planted myself and took in the aquamarine waves. I read my book (clearly Stephen King … I think my father-in-law’s spelling has seeped into my brain) and rested up, feeling even better when the meter was up. I drove back downtown (quite the feat as the sun was sinking and traffic was heavy) and decided instead of going to the hotel I’d try the Bayside Marketplace again, where I’d turned around yesterday after being unable to find parking. This is an open-air market just about 12 blocks from the hotel (too far to walk) but full of restaurants and shops. I didn’t find anything there other than Bayside-specific post cards, but it was a good way to eat up a bit of the evening. Setting up Live Writer on my new PC just because. These shoes, from Target, were only $22 AND they had a size 11 (actually the only pair they had left). I was sorely tempted, but knew that A) I didn’t have any space to pack them and 2) when would I ever wear them. Related: I would really like to see Mad About You re-runs in the near future. I wonder if they’re on DVD. I’m sure a quick Google could resolve that. Also, setting this to publish in the morning, when I won’t have internet access. So we’ll see if that works. I am not good at vacationing on my own. I'm thinking I'm probably not good at vacationing together either, but I digress. Anyway, I wasted two hours driving round-trip today to Cauley Square ... and when I got there I was the only shopper, everything seemed overgrown and REEKED of nag champa. The killer part was after I saw a couple cats a LIVE raccoon was looking at me, sitting on the path with its little paws up, almost like it would attack. I just backed away and headed back to the car, not even going in any of the shops. I guess I give up too easily. I went back to South Beach and had lunch, watched the waves for a while and then went to a free Botanical garden (get what you pay for aka dud city) and the Holocaust monument there (kind of a creepy sculpture, but that's part of the point). After driving aimlessly (well, toward a shopping center) I couldn't find parking nearby and just gave up, went back to the hotel, went to the gym and then a very brief swim. I'm reading a 12-year-old Steven King book that I picked up at Target yesterday and YOWZA I'd forgotten how great of a writer he is, and I'll have to start reading more of his stuff that I've missed. This is what I get for not planning and being more oriented. But I'm having fun driving when it's on the bridges over the water with the sweeping views of the city skyline and/or the shore line. Thank goodness for the GPS (photo of Shawn setting it up the first time in the rental car -- a brand new 2010 Nissan Altima with 4 miles on the odometer before we got it). I haven't transferred over any other photos yet, but will. Blogger girl out, as I think Shawn may be finished practicing his presentation, in which case I can go back upstairs to the room. Although Interneting is so fun! It's a diet and a place where we went last night. We didn't get it together to get to the beach before it was dark. The travel was OK, but I'll have to detail it more later. We're on our way to church soon. Advent for the win. If I blogged as much as I THOUGHT about blogging I'd have a robust and constantly updated blog. But when faced with the blinking cursor I'm less inspired. But since I'm home, on the computer and webcamming I think "i'll just head on over to blog spot and knock out a post." it really is getting to be quantity over quality, but i could beef things up if i took better thought notes. But my internal dialogues are fun for me, and less so in digital print. I also have several photos to transfer over -- of the time in Danville and of my birthday cards all lined up. My package from my mom came yesterday, chock full of purple goodies. I got to wear a new necklace today! My purchases from VA are still making me happy. The most comfortable sweat pants/lounge pants ever, a super warm (and super discounted) grey bath robe and a purple cowl neck sweater with mini pockets on the front. Super cute, and even Shawn agrees. And surprisingly those purchases and the Christmas cards (which actually don't seem like something I would pick out ... "season's greetings"?!) fit in my carry on. Shawn has six things on his Amazon wish list. That cracks me up, and when I said something he said "well i'm not asking for all of them" like i was insinuating he was being greedy. I said he should put more things on it. But I guess it gives the general idea of what he likes. I still struggle to find gifts for him, even though I arguably know him better than anyone. So instead I buy things that I want him to use and go from there. Silly! Walked all the way to the doctor's office this morning without ANYONE annoying me. Usually there's someone on the street who steps in front of me, or a car almost hits me or something. But today, refreshingly, it was just a chilly walk to Union Square faced with no annoyances. That ended when I got on the elevator and was bumped by someone else, forcefully. But I gritted my teeth and tried to keep the contentment going. God waits for me in the stillness. "Please be advised that if you are more than 15 minutes late for your appointment we reserve the right to reschedule it." I wonder if this applies coming late to the appointment when your doctor is running an hour and a half behind (true story, and why I selected the earliest appointment possible). Because if you show up late you're effectively early since she won't be seeing you on time anyway. I'd never be brave enough to test that theory though. Another couple early mornings in my future as I head out to a work-related conference here in the city. Someone gave me a comp invite, and although it's not ideal because of my upcoming travel/vacation schedule and work load I'm faced with, I'm still taking any chance I can get to get out of the apartment and among the living. Can't promise daily posts in December, but today I needed to write this if only to get to post 667!